You create the program and save HR the headache of figuring out how to find a facility that performs all these procedures at once. Make the phone calls to the physician, physiologist and nutritionist, schedule the appointments, and include the cost of the executive health screening management in your corporate wellness bid. Remember, you’re not managing the actual payment for the health screening services by the nutritionist, physiologist or physician. They manage their own billing and work with the corporation’s health insurance program. You’re simple directing the process and providing access to a team, then managing the outcome by prescribing proper exercise and coordinating any necessary follow-up appointments. If you already have a corporate wellness program, this is a perk that will allow you to charge more for your services. 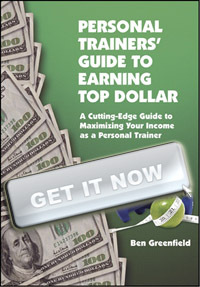 If you’re wanting to implement a corporate wellness program, but don’t know where to start, I recommend the entire chapter of Train For Top Dollar that is devoted to offsite training. Whether home or corporate based, an offsite personal training program is a perfect solution for a trainer who wants to enhance their income, or eliminate the hassle of a studio or gym. Like the digital information product, the biggest advantage is that there are very few costs involved. Not having to pay a lease or maintain equipment leaves you with much less headache and more money in your pocket. Use the examples in Chapter 9, “Offsite Training”, to launch your offsite training business tomorrow!